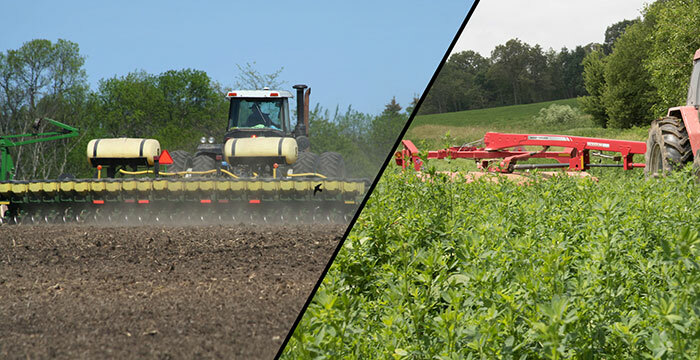 While in some areas of the U.S. a second cutting of alfalfa is done or in the process of being made, that’s not the case in the Midwest and Northeast. Farmers in these regions just recently parked their snow-removal equipment. The good news is that spring weather has finally made its presence felt, and the growth of perennial forages can now easily be seen from the pickup seat. Still, 2018 won’t be characterized as anything other than a late spring. Fieldwork is well behind normal, and it’s easy to see how the first-cut hay harvest may collide with the back end of corn planting. For Lawrence and others who analyze this sort of thing, the number one focus should be on a timely harvest of first cutting. If labor is at a premium, that might mean parking the corn planter, especially if you have alfalfa-grass mixtures. “The window for planting (corn) for silage is generally wider than for grain, which is why first cutting can and should take priority over corn planting,” explains Lawrence. This has to be done even with the realization that corn silage yields may suffer a bit with delayed planting. According to Lawrence, research from Cornell and Penn State shows that a 0.5 to 1 ton per-acre drop in silage yields occurs for each week’s delay in planting after mid- to late-May. Although that’s significant, the potential impact of a delayed first cutting on forage quality is even more damaging to animal performance. In Wisconsin, extension corn agronomist Joe Lauer notes that his field trials showed a yield decline of 0.04 ton of dry matter per acre per day between May 16 and May 30. The yield loss really starts to ramp up during June. “Even so, there are few, if any, better June-planted forage alternatives from a yield and quality perspective than corn for silage,” Lauer says. As important as it is to cut alfalfa on time, if you rely heavily on winter annuals such as rye or triticale, the cut date becomes even more crucial. Said another way, cereal forage can go from candy to cordwood in a matter of days. New York crop consultant Tom Kilcer notes that the maturity of winter annuals will be impacted by fall planting date, soil type, and field orientation. This might offer opportunities to spread harvests and be timely over a large acreage. If that’s the case or not, Kilcer cautions that this won’t be a year to cut by calendar date. Monitor fields closely and target flag leaf emergence as your time to cut. “Just because corn planting is delayed, there is no need to panic and flush the winter forage down the drain in a rush to get corn planted,” Kilcer says. “Ironically, the winter forage produces more milk per ton than even brown midrib corn silage,” he adds. In Kilcer’s experience, once the cereal forage is harvested, corn or alfalfa can be successfully no-tilled into the field. Cornell’s Lawrence suggests that for dairy producers who work with custom operators, it might be prudent to set up a time to meet with them and discuss plans for the first-cut hay harvest. During the conversation, expectations and goals need to be clearly defined because their schedule is going to be condensed as well. It’s now become an old story, but one that can really never be discarded into the discount books section: Timely forage cutting drives profitability. Some years are easier than others; unfortunately, it doesn’t appear that 2018 will be one of the easy ones.